This is the jaw-dropping moment a 22-year-old spear-fisherman fought off a Great White Shark as it came to attack him. In just ten-feet of water on the Santa Barbara coast of California you probably wouldn’t expect to be attacked by a Great White with a taste for blood – but that’s exactly what happened to Tyler McQuillan as he was spear-fishing with friends, reports Stuff. At first, Tyler thought his friends were playing a prank on him – but it was not his friends, it was a Great White which proceeded to take a pretty nasty nip into his toes. 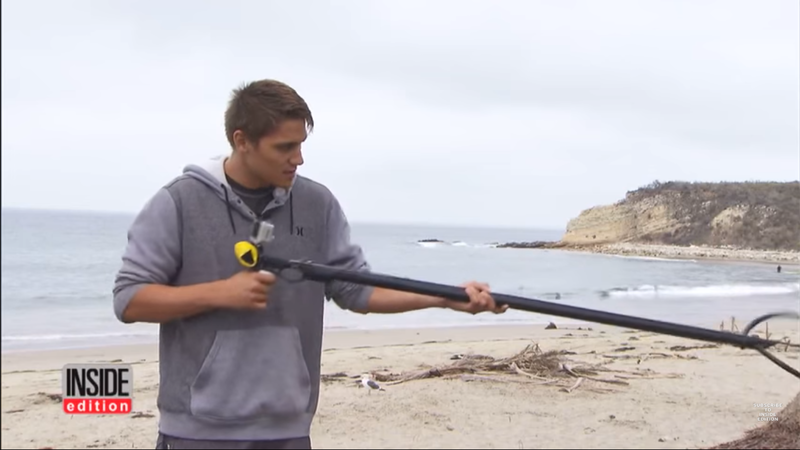 Tyler panicked momentarily, dropping his speargun, but as the shark swam away he retrieved the gun – a move which without doubt saved his life, as the shark came back hungry. When it comes back, the shark goes for Tyler’s head but he’s able to push against it, however this shark simply is not giving up easy – coming back for a third time. This time Tyler was able to hit it hard with his speargun before the great white finally decided enough was enough and left him alone. When Tyler got out of the water he realised that the small shark bite had broken two of his toes – but hey, it’s a lot better than it could’ve been. Tyler is lucky to be alive – go and buy a lottery ticket son.